Create a schedule to send messages automatically at a specific time. By sending personalized messages to your customers, you make a great first impression and become more memorable! You can use SA Group Text to create the personalized messages. Each message has the same kind of information, yet the content of each message is unique. 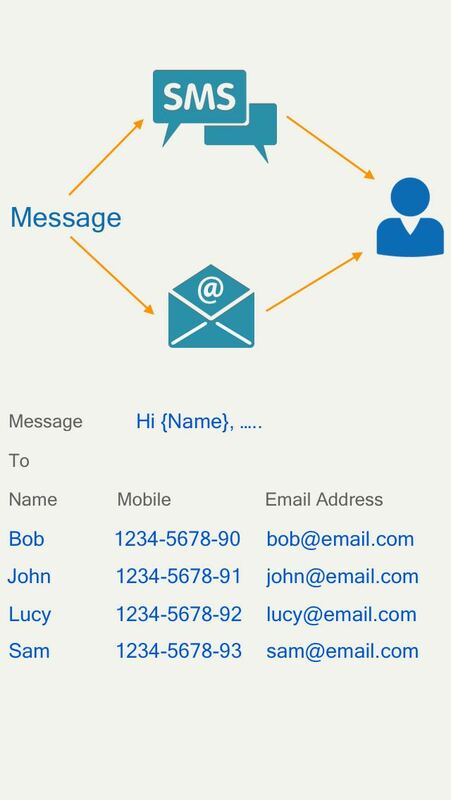 For example, in message to your customers, each message can be personalized to address each customer by name. 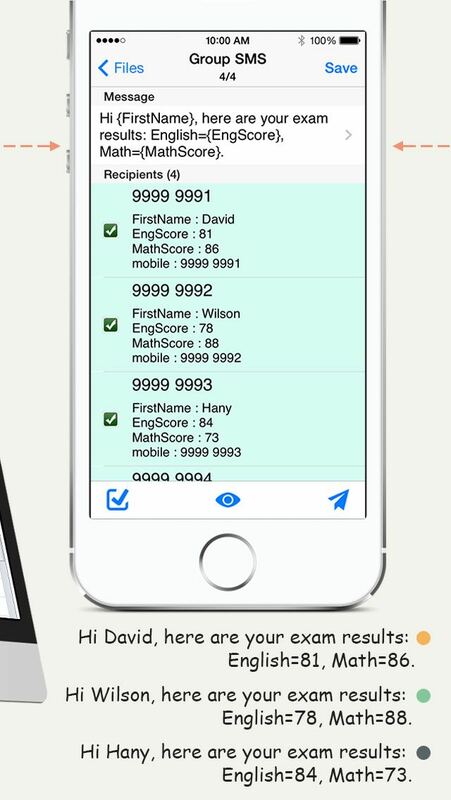 You can use any Excel-compatible applications to create your group text messages. Be sure to save as an Excel 97-2003 Workbook. The file can contain only two columns : Mobile and Message. Here are more example spreadsheets for SA Group Text. You can create a schedule in SA Group Text to send messages automatically at a specific time. Due to iOS restriction, 3rd party app can not send message without user interaction, each message has to be confirmed by the user. so this feature is only available on Android. 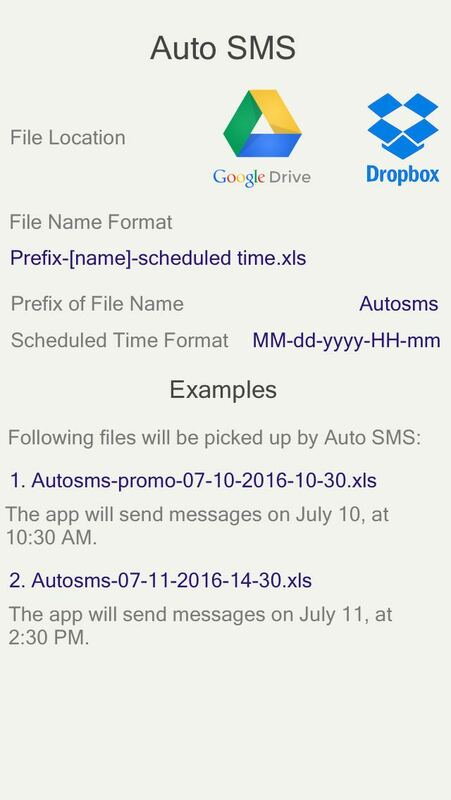 Once you upload an excel file for AutoSMS into a folder on Google Drive or Dropbox, the app will import it automatically and send messages at the time you specified. After all messages are sent out, the app will generate the delivery report and upload it to the same folder where the excel file for AutoSMS locates. This feature is only available on Android. SA Group Text can generate the delivery report. It's also an Excel spreadsheet. You can see all failed and undelivered messages. 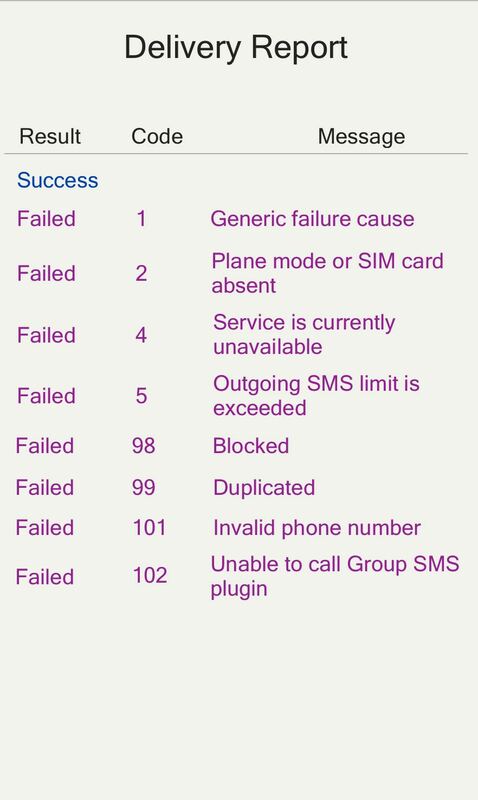 For those failed messages, there's an error code to let you know why it fails. SA Group Text can send email as well. After the message is sent to a recipient, the app can then send the same message to the recipient's mailbox. 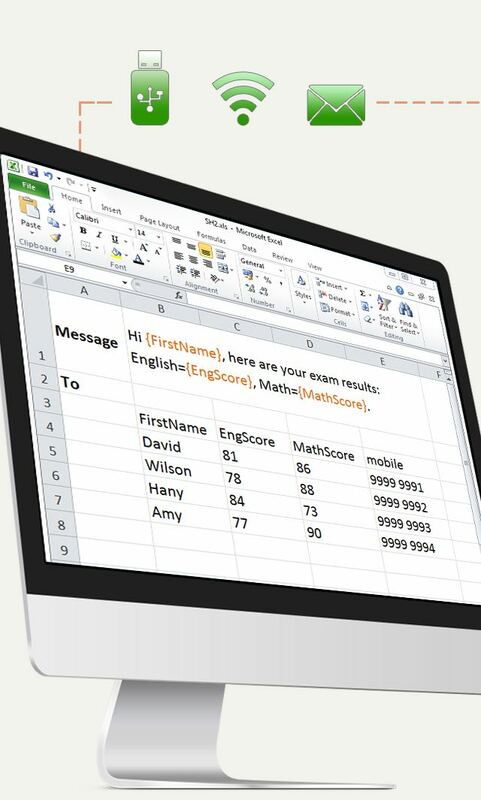 You have to add a column titled "EmailAddress" in the excel file and enter the email addresses. Since V3.6.10, we've removed delivery report feature and default sms handler capability due to Google’s SMS/Call Log restrictions. Here's the application with full functionality. You can click the Download below to download the latest version and install it on your android phone. It will overwrite SA Group Text Lite app on your phone. If you purchased the pro version from Google play market, here's the way to get the pro version of full-function app. 1. Download and install the lite version. 2. Go to the app's settings, select Upgrade to Pro and License Key. send the IMEI you see to support@samapp.com. 3. We will send the license key to you soon after we receive your email. Is there anyway to automatically send through without any interruption by user? iOS does not allow 3rd party app send text without user interaction. There’s 2 ways to send text without user interaction. 1.If you have jailbroken iPhone, please download ExcelSMS Auto which can send text without user interaction. 2.If you have android phone, please download SA Group Text from google play market. it can send text in background. Is there any way to make sure people know who’s texting them? Aside from identifying yourself in the message, sadly not really. If they have your number saved in their phone, then they would see your name instead of your number, but you would have to educate them on that. 1. If the number is changed, carriers may reject the SMS message as spam which could cause your message to be filtered. 2. It’s also important to consider that SMS messages require recipients to have the option to opt-out. If the number is changed, recipients will not be able to opt-out of the texts that they receive. 3. Some countries do not permit this information to be modified. Why the app can not write to external sd card on Android 4.4+? Google has blocked write access to external storage devices in Android 4.4+. So you have to choose a folder on the internal storage. Then move the file between the external storage and internal storage using the built-in File manager. Is there a Character Limit on how long the text can be? All SMS messages have an industry set limit of 160 standard characters or 70 characters in non Latin alpahbet. However, it is possible to send messages that are longer than this limit by dividing the message into smaller parts that are sent as single SMS but seamlessly combined once the message reaches its destination. Modern mobile handsets are then able to "stitch" multipart messages back into a single, seamless message. SA Group Text can send long text. on Android 4.4 and above, please choose SA Group Text as the default SMS application before you send messages through the app. otherwise your client might receive the separated message. Why did the app not support dual sim card? Dual sim are available but not documented and hence not officially supported by Google. We know some manufacturers provide their own way to access dual sim, but we could not find documented api from these manufacturers. we will try to support dual sim for some kind of phone in the future. Now you have to change the default sim slot on the setting page if you want to choose another sim to send sms. How many messages can I send at one time? The lite version can send 120 sms at one time. the pro version has no limit. But Android has a limit that one app can send up to 100 messages per hour. You can download our Group SMS plugins to extend this limit. After downloading 30 Group SMS plugins, you can send 3100 messages per hour. Love this app! I used it on my S3 right before it died so had to go back to manual texting everyone. I now have a Note4 and it was so awesome to set up a text tonight and to be able to schedule it for 10am tomorrow! Very good app. Connect data base with phone Database exports a report to excel by windows scheduler to the drop box folder... this app reads the excell doc and sends the messages. Brilliant! 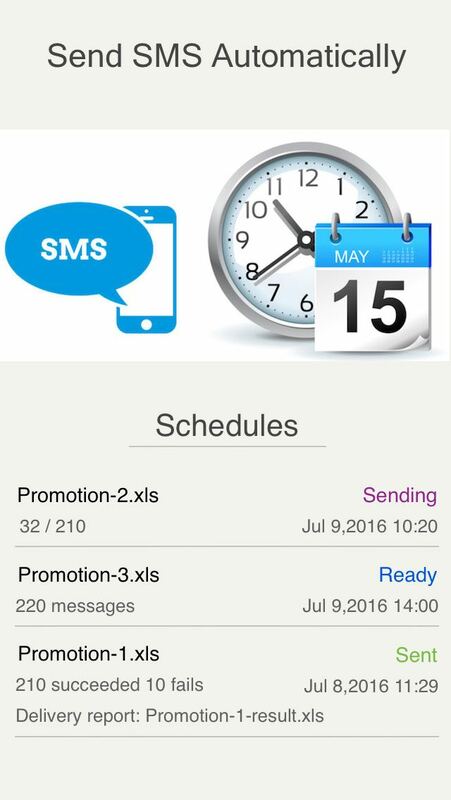 ExcelSMS application is best bulk SMS marketing tool both for Android and iOs users! (And I tried a lot of them) Best wishes to your business future! 》》Please add an ability to also import XLSX (newer office format) files. Brilliant app. Just transfer the Excel file to the phone via USB and it all works amazingly. Love that it is so flexible with being able to define unlimited merge fields in the texts. And the additional plugins are a superb innovation, enabling me to send more than 100 sms messages per hour. Thank you Developer This application helped me lot to expand my business. 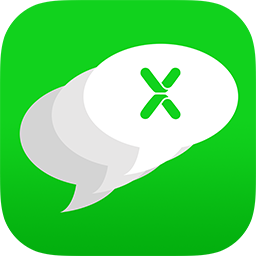 For business people out there; this is the best messaging application you could ever have. Does EXACTLY what it says it does Tried at least 8 other apps to send texts to regular groups of people. Either they used contact groups, but you had to then delete home and work numbers, or just didn't work. None let you create custom groups of custom NUMBERS. This does and works great. Now I can invite a specific group of numbers to a movie, or update on a surgery, whatever. Easy to send group sms when you don't want to have them stored all in your phone. Only import Excell phone lists and start right away. Works great. I rely on text message marketing as the back bone of my business, sending approx 400-500 per week on iPhone 6. I've tried other programs but nothing is better than this. I don't need to personalize my texts but you can with this program. It's just a very useful App that does what I need it to do. I use this every week, sometimes multiple times a week! It's just brilliant, took a little getting used to and working out, but now couldn't be without it! Just hope they keep the updates coming with the iPhone updates too. Fully recommend to anyone.